Rent villas and apartments in Gumusluk, Turkey with private pools. Book affordable holiday rentals that are near a beach and golf course. 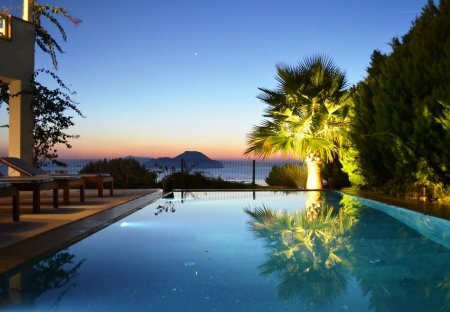 Incredible Sunset Villa comprising of two, 2 bed apartments with an incredible Greek island view. Sleeps 8, wonderful private black marble infinity pool and well maintained gardens. Our lovely 3 bedroom, 2 bathroom family villa is located close to the sea. With A/C, wi-fi internet, roof terrace, patio and balcony, plus there are 2 swimming pools for exclusive use of 14 houses. This Villa offers breathtaking, panoramic sea views from almost anywhere on the property and comes with a new private full-size infinity edge pool featuring built in seating. Modern Villa with a Contemporary Feel, Stunning Views of the Shimmering Aegean Sea Plenty of Space to Relax, Unwind, BBQ and De-Stress. WiFi. Bakery, Supermarket and Bar 5 mins walk. This 2 bedroom apartment with shared pool is located in is located in Gumusluk and sleeps 5 people. It has barbeque facilities, parking nearby and air conditioning. This 3 bedroom well-appointed duplex villa situated in a spacious garden with private infinity pool with a western facing panoramic sea view with an incredible sunset every night. Beautifully furnished two bedroom penthouse apartment on a luxury complex in Yalikavak, Bodrum, Turkey with great sunsets and sea views. Luxury 3 bedroom self catering private holiday villa with private swimming pool at perfect location very close to beach. Be right on the sandy beach, Self catering 4 bedroom private traditional style beach bungalow located right on the beach with amazing sea, sunset and island views for rent in Kadikalesi, Bodrum. VIP Luxury fully furnished 2 bedroom, seaside apartment located in Turgutreis at one of the best locations on the Bodrum peninsula in Turkey. Special site with private beach and perfect sea views. Villa to rent in Myndos Hills. Near Gumusluk and Yalikavak. Bodrum peninsula. Fully air-conditioned. All mod cons. 3 bedrooms 2 bathrooms and downstairs WC. Huge fabulous main pool and kiddies pool.